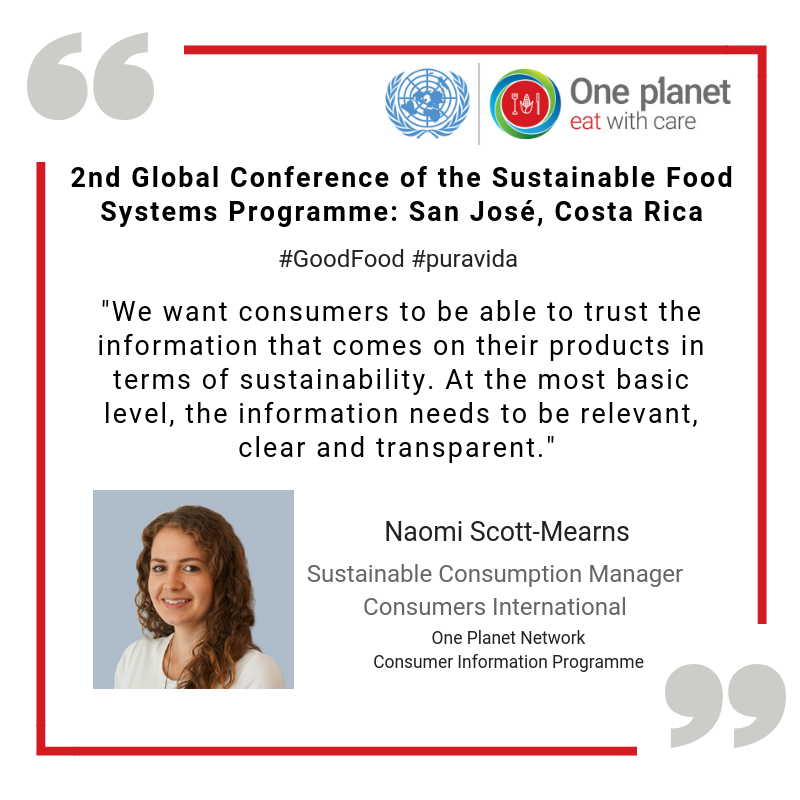 The Sustainable Food Systems and Consumer Information Programmes of the One Planet network jointly hosted a side event as part of the 2nd global conference of the Sustainable Food Systems Programme, held in Costa Rica 5 – 7th February 2019. The side event was set in the context of the global challenge of sustainable food consumption and production against the backdrop of low consumer awareness of sustainable food options and the lack of international guidance on how to efficiently convey credible sustainability product information to consumers. Thus, the side event examined examples and best practice of engaging consumers in sustainable food systems, including diets and food waste. WWF’s recent global awareness survey has revealed that 91% of respondents do not realize the extent of the threat of the food system to the planet: the food system is currently accountable for one quarter of global greenhouse gas emissions and 70% of biodiversity loss. This result sets a global priority for communication to all about both the value and risks of our food system to the planet. The importance of providing reliable information has been internationally recognized by Agenda 2030 through target 12.8. With this in mind, the five fundamental principles of the UN Guidelines for Providing Product Sustainability Information were examined during the side event. An overview of the ‘roadtesting’ of the Guidelines was given, which was a project that aimed to test the applicability and utility of the Guidelines for those providing product sustainability information to consumers. The project engaged organisations from all sectors and all world regions and there were several related to food involved including Mondelez International (you can read a case study about their participation here), Marine Stewardship Council (case study here) and the Rainforest Alliance. Tanja Ploetz of WWF presented an overview of an ongoing project funded through the International Climate Initiative (IKI) of the German environmental ministry (BMU) implemented in Thailand, Indonesia and the Philippines. The project involves multiple stakeholders including governments, consumers and businesses to work towards sustainable consumption and production in the SE Asian region. 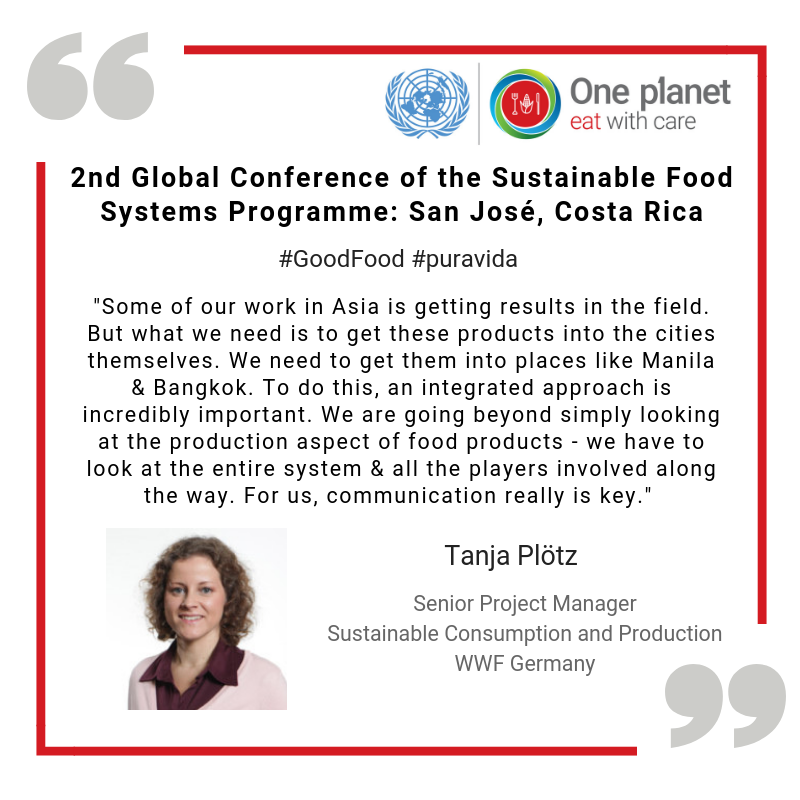 In the Philippines, the project has created partnerships between the food and tourism sector to reduce food waste and offer healthier food options to consumers. Messages to boost consumer awareness of their consumption included flash cards bearing messages such as “take only what you can eat” and promoting hashtags on social media such as #TheSustainableDiner. The IKI projects in SE Asia by WWF highlight the importance of a multi-stakeholder approach to food systems. Food is a cross-cutting topic involving a huge range of stakeholders and to evoke successful transformational change, the full range of stakeholders need to be involved. An integrated approach must be taken to climate, nature and food involving consumers, businesses, civil society and governments. In the context of the theme of the 2nd global Sustainable Food Systems Programme conference – “to strengthen multi-stakeholder action for the transformation to sustainable food systems” – this message echoed loudly. The Mi Código Verde platform was presented as an example of consumer empowerment and education towards sustainability in the food sector. 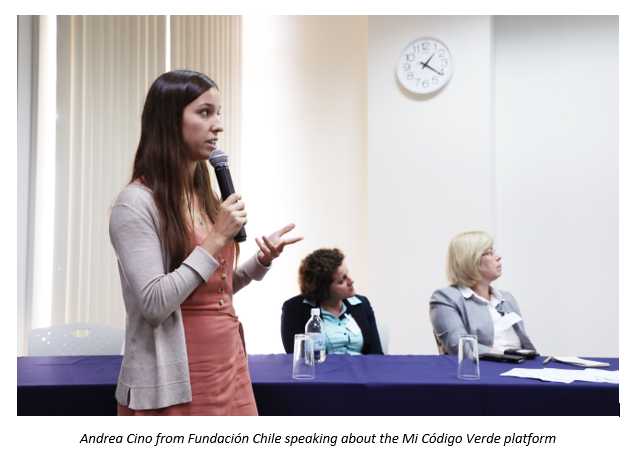 Mi Código Verde is a web-based platform in Chile that generates and provides information on the environmental and social attributes of consumer goods in order to empower and enable them to make sustainable decisions. Many food products are listed on the platform including wine, coffee, eggs and meat. By mobilizing more informed and educated consumers, Mi Código Verde intends to incentivise and guide producers on improving the sustainability standard of their products. The platform has proved a success in Chile with more than 56,000 consumers visiting the site within the first 3 months and responses to surveys have highlighted that consumers consistently validate the initiative and find it a valuable tool to promote sustainable consumption. Yet, challenges remain as it is difficult to measure how providing consumers with information really results in long term changes in behaviour and purchasing choices. Indeed, the challenge of moving from a niche position informing those who are already engaged or easy to reach towards influencing the mainstream was debated in the lively question and answer session at the end of the side event. It remains something that the Sustainable Food Systems and Consumer Information Programmes of the One Planet network need to continue to work on as part of the One Plan for One Planet Strategy to 2022.